SPACEPORT NEWSPage 3 October 29, 1999Hot links! The Galileo space probe came within 380 miles of Jupiters volcanic moon Io on Oct. 10, beginning a splendid finale to its four-year mission. Io lies in an area of intense radiation from Jupiters radiation belts, and mission managers had expressed concern that Galileos computers and guidance systems might not survive the trip, but an hour after the craft had its closest encounter with Io, Project Manager Jim Erickson at NASAs Jet Propulsion Laboratory in Pasadena, Calif., said all systems were functioning normally. Erickson said Galileo did experience computer problems during its encounter with Io when it passed through the densest part of the radiation belt around the Jovian moon, but NASA technicians were able to bypass the problem and reset the computer. Duane Bindschadler, Galileos manager of science operations for NASA, said the flyby was important because Io is a natural laboratory for volcanoes. By studying Io close up, we will learn more about how and when volcanoes erupt and why they act the way they do. This may even help us predict the behavior of volcanoes on Earth, Bindschadler said. Scientific data on Io from Galileo was not expected to reach Earth until November after being transmitted through its low-gain antenna. But Erickson said Galileo was successfully sending data about its position, time and trajectory after the successful flyby. Galileo was deployed from the orbiter Atlantis in 1989 during the STS-34 and arrived at Jupiter in 1995. Its primary mission focusing on the giant planet ended in 1997. Galileo then began the its extended mission to study Europa, Jupiters enigmatic ice-covered moon, as well as Io and other Jovian satellites. This most recent flyby was just the start of Galileos grand finale: The spacecraft is scheduled to make an even closer approach of Io on Nov. 25, flying within 186 miles of the surface. The extended mission is scheduled for completion in January.Galileo keeps an eye on IoA plume of gas and particles is ejected about 60 miles above Io's Masubi region in an image captured by the Galileo spacecraft. The image has been enhanced to highlight the plume. Galileo was deployed by the crew of STS-34, a mission that launched from KSC Oct. 18, 1989. In a continuing effort to keep Spaceport News readers well informed about NASA and space-related news and events, a listing of hot Interent links will be provided as a service to readers every few issues. The following is a sample of sources in cyberspace where information of interest to the space community can be found. NASA News http://www.nasa.gov/today/index.html NASA Image Exchange http://nix.nasa.gov Shuttle countdown http://www.ksc.nasa.gov/shuttle/countdown/ International Space Station http://station.nasa.gov/index-n.html Expendable Launch Vehicles schedule http://www.ksc.nasa.gov/elv/index-n.html The X-planes http://www1.msfc.nasa.gov/NEWMSFC/ xplanes.html Planetary Photo Journal http://photojournal.jpl.nasa.gov Mars http://mars.jpl.nasa.gov Chandra X-ray Observatory News http://chandra.nasa.gov/chandra.html KSC 2000 http://www-pao.ksc.nasa.gov/ kscpao/ksc2000/2000team.htmDays of Caring celebrated Oct. 22 and 23KSC employees (above) donated elbow grease and smiles to the 1999 Days of Caring project on Oct. 22 and 23. The donation of time and effort turned out to be a great success for both Kennedy Space Center personnel and especially for some grateful senior citizens of Baxley Manor, a building of low-income apartments. On Oct. 22 and 23, about 140 NASA employees participated in the repainting project at Baxley Manor on Merritt Island and also in other projects around Brevard County. If you have questions about this project or other ways in which you can get involved through KSCs Community Relations Council, contact Liz Osborne at 867-4388 or Carol Cavanaugh at 867-2363. SPACEPORT NEWSOctober 29, 1999 Page 6 October employees of the month are, from left to right, Al Diaz, Shuttle Processing; Johnny Shamrock; Engineering Development; Geoffrey Swanson, Office of the Chief Counsel; Gloria Norton, Office of the Chief Financial Officer; Wayne Ranow, Logistics Operations; Lisa Zuber, Office of the Chief Information Officer; and David Cox, Space Station and Shuttle Payloads. Not shown are Michael Dalton, Checkout and Launch Control System Office; Abraham Negron, Safety and Mission Assurance; Nazario Escobar, Installation Operations; Steve Brisbin, Biomedical Office; Bob Raymond, Space Station Hardware Integration Office; and Maria Lopez-Tellado, ELV and Payload Carriers Program.October employees of the monthKSC/Cape Canaveral Air Station Open House just around the corner Its an Open House with quite a few rooms added. KSC employees will have more areas to explore than ever before at the KSC/Cape Canaveral Air Station (CCAS) Employee Open House on Nov. 6. The traditional KSC event has been expanded to include many historic sites on CCAS as well as the grounds of the Naval Ordnance Test Unit. The theme Space Partners Opening the Gateway to the Future reflects the new era of collaboration between NASA and the 45th Space Wing. This event is always one of the highlights of the year for our employees and their families, KSC Director Roy Bridges said. We are especially pleased this year to welcome the Air Stations employees to visit our facilities, and Im sure our employees will enjoy the opportunity to see the historic sites on the Cape side. Gates will open for the event at 9 a.m. and close at 2:30 p.m., with most facilities closing at 3 p.m. Employees and their guests will be admitted through Gates 2B, 2C, 3 and 4 at KSC and Gate 1 at CCAS. Each vehicle (no larger than a 15passenger van) must contain at least one badged employee. Among the days many highlights, six astronauts will be present at various locations, including Orbiter Processing Facility Bay 3 and the Operations and Checkout Building at KSC; and Complex 14 and the Air Force Space and Missile Museum at CCAS. Guests can enjoy a driving tour of Launch Complex 39 Pads A and B, and if the current launch schedule holds, Shuttle Discovery will be seen at Pad B as it is prepared for the STS-103 mission. Plans call for the High Bay 3 door of the Vehicle Assembly Building (VAB) to be open, allowing a view of the external tank and solid rocket boosters stacked for STS-99. The adjacent Launch Control Complex will also be open, with access to two firing rooms. The nearby Orbiter Processing Facility will feature displays of Thermal Protection System, orbiter processing hardware and other equipment. The OPF-3 low bay is scheduled to be open, yielding a view of the orbiter Atlantis, and the Thermal Protection System Facility will give guests a look at the tiles used to protect the orbiters. A self-guided tour will be available in the Solid Rocket Booster Assembly and Refurbishment Facility. Another perennial favorite is the Shuttle Landing Facility (SLF). Drivers can enter near the midpoint at Sharkey Road, and signs will direct them around the facility. The Operations and Checkout Building will offer views of the International Space Station S0 Truss Element, and several exhibits also will be on display in the Mission Briefing Room. Although the Space Station Processing Facilitys high bay will be closed to visitors, guests will have an opportunity to see International Space Station (ISS) flight hardware from the high bay viewing window at the ISS Center. The Advanced Systems Laboratory will demonstrate some of the automation and robotics projects being developed to improve Shuttle ground processing operations. In addition, some of the advanced software exhibits in the Intelligent Systems Lab will offer a chance for visitor interaction. The KSC Visitor Complex will offer special opportunities for employees, who may pick up complimentary tickets to the Robot Scouts and Universe Theater attractions at the Guest Relations Desk. The Center for Space Education, located in the Visitor Complex, will have hands-on science activities for students. The list of open facilities at Cape Canaveral Air Station includes Complex 3, site of the first rocket launch at Cape Canaveral on July 24, 1950. The adjacent complexes 1, 2 and 4 also are included in the tour. Complex 14 features the Mercury Monument, dedicated in 1964. A time capsule buried beneath the monument is scheduled for retrieval in the year 2464. Four manned launches took place at Complex 14, including Friendship 7, which made John Glenn the first American to orbit the Earth. Another National Historic Landmark, Complex 34, was the launching pad for the first missions of the Apollo program. Complex 40, the northernmost launch structure on CCAS, also will be available for viewing. Also, the Air Force Space and Missile will have numerous rockets and missiles on display, as will the indoor exhibits in the Complex 26 Blockhouse and Exhibit Hall. Visitors will have a rare chance to visit the Cape Canaveral Lighthouse, the oldest structure on CCAS. Though safety concerns prevent visitors from entering the lighthouse, visitors have a chance to park and take photos. The Naval Ordnance Test Unit (NOTU), located on the northern side of Port Canaveral, exists to support Trident missile test and submarine operations at Cape Canaveral. Its facilities include missile assembly and checkout areas, missile storage magazines, the Trident launch pad at Complex 46 and two waterfront structures, Poseidon Wharf and Trident Wharf. The entrance is at Basin Drive, off Phillips Parkway just east of Gate 1. Food and drink services will be available at several places during the day, and all four NASA Exchange retail stores will be open for business during the event. The stores will offer free commemorative medallions to visitors while supplies last. The gift shop in the CCAS museum also will be open. Brochures containing detailed descriptions of the facilities and maps will be distributed to employees before the event. On Open House day, copies will be available at security gates. Check the brochure and the Open House website at http://kscinfo.ksc.nasa. gov/openhouse/ for more detailed information. SPACEPORT NEWS October 29, 1999 Page 7 Think Ability highlighted at Disability Awareness and Action Working Group Technology FairTechnology 2009 KSC is leading a major initiative to identify the technologies that will enable revolutionary spaceports of the future. The goal is to develop the infrastructure needed to support the next generation of manned space planes, which would take off and land much like a commercial aircraft, and eventually carry passengers. 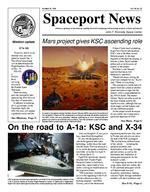 KSC has initiated a joint-sponsored research program called Vision Spaceport. Current partners, referred to collectively as the Spaceport Synergy Team, include KSC, NASAs Ames Research Center, The Boeing Company, Command and Control Technologies, Lockheed Martin, Quantum Technologies Services, Science Applications International Corporation, and the University of Central Florida. On Nov. 1-3, NASA will sponsor a national technology transfer conference called Technology 2009 at the Miami Fontainebleau Hilton, where the Spaceport Synergy Team will be looking for design ideas, partners and investors. The Vision Spaceport initiative will be one of the main tracks of a workshop to be held during the conference. The workshop will focus on emerging business opportunities in aerospace, aviation, space-based manufacturing and related technologies. For more information about the conference, check out http://www. techeast.net and learn more about Vision Spaceport at http://www. visionspaceport.org On Oct. 18, NASA released a Request for Proposal (RFP) for multiple award Indefinite Delivery Indefinite Quantity (IDIQ) Launch Services contracts covering a broad range of expendable launch vehicles. Called the NASA Launch Services contracts, for which KSC has lead center responsibility, the RFP includes medium-light, medium, intermediate and heavy launch vehicles with a performance capability of launching payloads of 3,300 pounds and greater. Traditional examples of vehicles in this performance range are the Athena II, Delta and Atlas class family of expendable launch vehicles. The NASA Launch Services contracts will span a 10-year period and include an initial mission set of three firm launches with six additional launch options. The contracts also include an IDIQ portion under which up to 60 additional launches can be competed and awarded. If all firm, option and IDIQ launches are awarded, the total value of the NASA Launch Services contracts could exceed five billion dollars. The NASA Launch Services contracts also contain an on-ramp clause under the IDIQ contract portion. This will create an opportunity for new, emerging launch service providers and incumbents to introduce qualified launch vehicles not available at the time of the award of the initial contracts, and to compete for additional launch service requirements not identified as firm or option requirements under the basic contracts. NASA is soliciting proposals from all interested companies. It is NASAs intent to award multiple IDIQ task order contracts that will encompass a broad range of launch vehicles. To be eligible for award of a contract, the potential launch service provider must be a domestic company with at least 51 percent United States ownership. It must also have demonstrated at least one successful launch of at least a 3,315-pound payload to a 125-mile circular orbit at a 28.5 degree inclination. The launch vehicle to be considered must be a domestic product with a least 51 percent of its components manufactured in the United States. Also, the potential launch service provider and its subcontractors must have ISO 9001 certification. Proposals are due at the Kennedy Space Center not later than Jan. 7, 2000. The contract awards will be made during the second quarter of 2000.RFP issued for Launch Services contractsCenter Director Roy Bridges stopped to pet one of the dogs that serves with Canine Companions for Independence, a vendor displaying its capabilities at the Disability Awareness and Action Working Group (DAAWG) Technology Fair, held Oct. 20-21 at KSC. The fair highlighted vendors demonstrating mobility, hearing, vision and silent disability assistive technology to create an awareness of the types of technology currently available to assist people with various disabilities in the workplace. The theme of the fair and this year's National Disability Employment Awareness Month is "Think Ability. "Missions ...(Continued from Page 1)spacecrafts computer. The new main computer 20 times faster with six times more memory than its predecessor was successfully tested aboard STS-95 in 1998. It is expected to dramatically increase capabilities, reduce maintenance and lower operational costs.STS-99 STS-99, scheduled to launch no earlier than Jan. 13, 2000, is the Shuttle Radar Topography Mission (SRTM) an international project spearheaded by the National Imagery and Mapping Agency and NASA, with participation of the German Aerospace Center DLR. Its objective is to obtain the most complete high-resolution digital topographic database of the Earth. John F. Kennedy Space Center Managing editor. . . . . . . . . . . . . . . . . Bruce Buckingham Editor. . . . . . . . . . . . . . . . . . . . . . . Susan Maurer Editorial support provided by InDyne Inc. Writers Group. NASA at KSC is located on the Internet at http://www.ksc.nasa.govUSGPO: 533-128/00018Spaceport News Spaceport News is an official publication of the Kennedy Space Center and is published on alternate Fridays by the Public Affairs Office in the interest of KSC civil service and contractor employees. Contributions are welcome and should be submitted two weeks before publication to the Media Services Branch, AB-F1. E-mail submissions can be sent to Susan.Maurer-1@ksc.nasa.gov SPACEPORT NEWSOctober 29, 1999 Page 8 When the countdown reached zero at historic Launch Complex 41 at Cape Canaveral Air Station on Oct. 14, history was made, but no rockets were launched. At the T-0 mark, the 34-year-old pad was imploded into a pile of twisted metal and memories in order to pave the way for a new line of Atlas V rockets. Demolishing the mobile service tower and umbilical tower at Launch Pad 41 the site of NASAs Viking spacecraft to Mars and Voyager probes to the outer planets, as well as many satellite launches was the quickest, cheapest way for Lockheed Martin to renovate the area for its new rockets. It also happened to be fun. The demolition the first at Cape Canaveral in 23 years turned into a party and charity fund-raiser. Hundreds of workers gathered a safe 2,500 feet away to watch the two steel launchtowers come tumbling down within milliseconds of each other. Hundreds of other onlookers at Cape Canaveral Air Station and Kennedy Space Center stopped wherever they were to watch the historic implosion. A countdown preceded the 10:05 a.m. demolition. At the precise moment the explosives (about 200 pounds) were detonated, the winner of a Demolish-the-Pad raffle pushed a make-believe plunger. Hundreds of $5 raffle tickets were sold to win the honor. The last time a launch pad was deliberately blown up, in 1976, the Army was called in to do the job. Launch Complex 14 John Glenns pad had become too dangerous, and the Air Force lacked the money to fix it. The much larger Launch Complex 41 was brought down by demolition experts hired by Lockheed Martin. Built in 1965, Complex 41 was the starting point for 27 Titan flights, most of them military. Initial construction began in 1963 with 6.5 million cubic yards of landfill dredged from the Banana River and hauled to the launch site. The first launch from the complex was on Dec. 21, 1965, with the launch of a Titan IIIC. In 1975, NASA launched its two Viking Mars landers and two years later, the twin Voyager interplanetary spacecrafts. Prior to the date of the implosion, demolition workers used blowtorches to weaken the legs of the 200-foot umbilical tower, from which propellants once flowed to the rockets. The 300-foot mobile service tower, which shielded the rockets until just before liftoff, stands 500 feet away. The towers wont be needed for Lockheed Martins powerful Atlas V, which will be transported from a still-unfinished building to the padHistoric launch pad is now history and ready for the futureVoyager 2, on an interplanetary mission to explore Jupiter and Saturn, was launched on Aug. 20, 1977, from Cape Canaveral Air Stations Launch Complex 41. It was propelled into space on a Titan/ Centaur rocket. Voyager 1 was launched from the same complex a few weeks later. Initially, both spacecraft were only supposed to explore two planets Jupiter and Saturn but the incredible success of those two first encounters and the good health of the spacecraft prompted NASA to extend Voyager 2s mission to Uranus and Neptune. Historic Launch Pad 41s umbilical tower (above left) at Cape Canaveral Air Station (CCAS) was demolished on Oct. 14, along with its mobile service tower (above right). The implosion left the launch complex a pile of twisted metal and memories from 34 years of launches, including several significant missions for NASA. The Viking 2 spacecraft (at left) was launched Sept. 9, 1975, from CCAS Launch Complex 41. Viking 2 entered Mars orbit less than one year later. The Viking Lander 2 touched down at Utopia Planitia on Sept. 3, 1976, and the Viking Orbiter 2 was powered down on July 25, 1978, after 706 orbits.a mere 12 hours before liftoff, a process intended to speed up launches. The first flight is set for 2001. The Atlas V also will soar from Vandenberg Air Force Base in California; an old launch pad there will be razed the same way. It may take about one month for the 7 million pounds of steel left after the demolition to be hauled away for recycling. To dismantle everything piece by piece the traditional method would have taken three months. After 27 launches spanning three decades, the last launch from Pad 41 was an Air Force Titan IVB rocket on Apr. 9, 1999. A total of 17 Titan III and 10 Titan IV rockets were launched from Launch Complex 41.